SHIGEO FUJITA has been studying and teaching bonsai for over 20 years. A self-taught bonsai practitioner, He has worked professionally in bonsai at the Japan Pavillion of a theme park in the US. His years of experience abroad give him a unique perspective and approach to introducing bonsai to those unfamiliar with it. 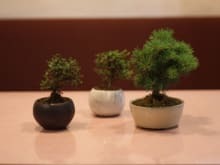 I really enjoyed to create small Bonsai. The various tiny trees are prepared and we can pick up which we want. The teacher, Fujita san, was very friendly and helpful. I think the world of Bonsai is quite deep and difficult but his advise were quite clear and easy to understand. I loved the smell of fresh soil, and touching pretty soft moss as well. Hope I can go back again soon!